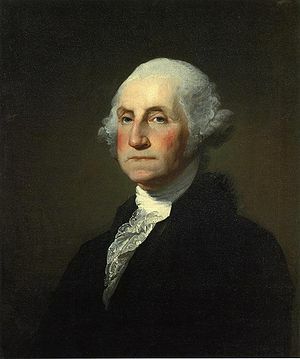 Portrait of George Washington by Gilbert Stuart. The Founding Fathers are the leaders who founded the United States, especially the 40 dignitaries who signed the U.S. Constitution at the Constitutional Convention of 1787, and the 56 signers of the Declaration of Independence. Historians consider the most important founders to include John Adams, Samuel Adams, Benjamin Franklin, Alexander Hamilton, Thomas Jefferson, James Madison, and George Washington. Washington is known for his leadership and honesty; Hamilton for his brilliance; John Adams for his morality; Franklin for his inventiveness; Madison for his scholarship; and Jefferson for his egalitarianism. The 55 initial participants—all of whom would be considered "Founders" in the broad sense of the term—wrote 15,000 articles, books and other materials. A study found that the Bible comprised 34% of their direct quotations. They particularly liked quoting the Book of Deuteronomy. The last surviving member of the signers of the Declaration was Charles Carroll of Carrollton, and the last surviving Founding Father was James Madison. The Founding Fathers sought "Honor"—freedom from corruption, and a positive devotion to civic virtue. These were key elements of Republicanism, and the Founding Fathers made republicanism the core values of the American system of government. Corruption was the great evil the Founding Fathers confronted. When Britain showed too much corruption, it was time to break free with the American Revolution. To overcome the temptations of corruption—such as luxury and bribery—in their own lives, the Founding Fathers cultivated the virtue of disinterestedness. That is, the made a conscious effort to not be the creature of his financial interests, and not give any sign to the public that they sought luxury or bribes. The goal was to be impartial, concerned only for the public good, not the advancement of friends or, still less, of party. Even personal shame and humiliation was preferable to a tarnished honor or the hint of corruption. When Treasury Secretary Alexander Hamilton was accused of corruption for making secret payments to a man named James Reynolds, Hamilton revealed he had been set up and was paying blackmail to Reynolds following an affair with Mrs. Reynolds. Duels over honor were common in the era—Hamilton was killed in one, as was Hamilton's son. This page has been accessed 66,330 times.